Halloween is fun…and hectic. Dinner doesn’t have to be chaotic too. 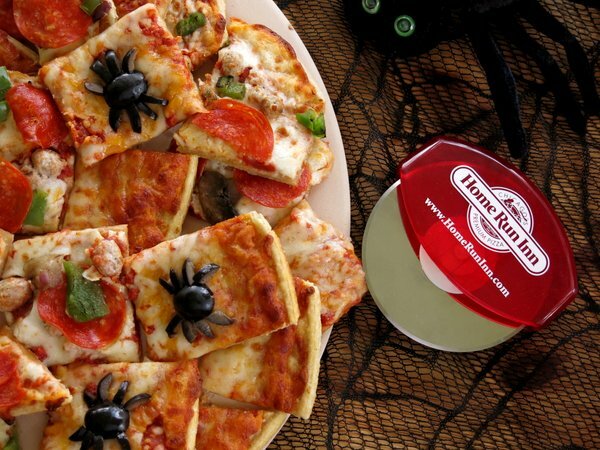 We have an Easy Halloween Pizza Party plan that will delight the goblins at your house and fuel everyone for a night of trick or treating! If you have trick or treaters, young or old, you’re probably familiar with the fast pace of events that occurs as dusk approaches. Each year I just know I’ve got it down and things will be different. I will start early so there will be plenty of time for pictures. Everyone will eat dinner and not just fill up on candy later. We will walk, not run, from house to house. Then it begins. I encourage everyone to get dressed early. 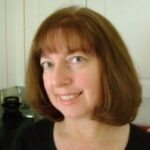 But, there are last minute touch-ups and costume adjustments to tend to. 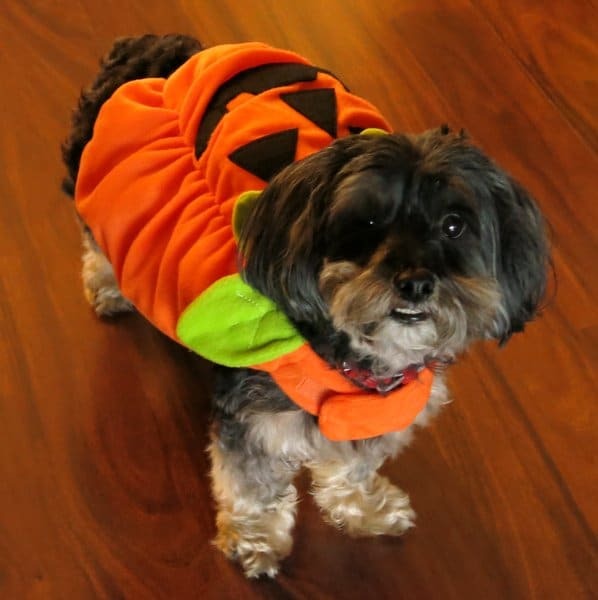 The doorbell begins ringing; the pup starts barking (and pleading with me to take off his costume asap.) Friends begin to arrive and are ready to descend upon the neighborhood. My hubby is just as excited as the kids and begins playing spooky music and dons his favorite mask. I get a few pictures (ok…quite a few, but not as many as I’d like) and then we’re off, as if to start a race and cover as much territory as possible in the allotted time. I’m hard pressed to get anyone to eat anything…unless there is pizza involved. Pizzzzaaaa! Nobody can pass up a slice of pizza. 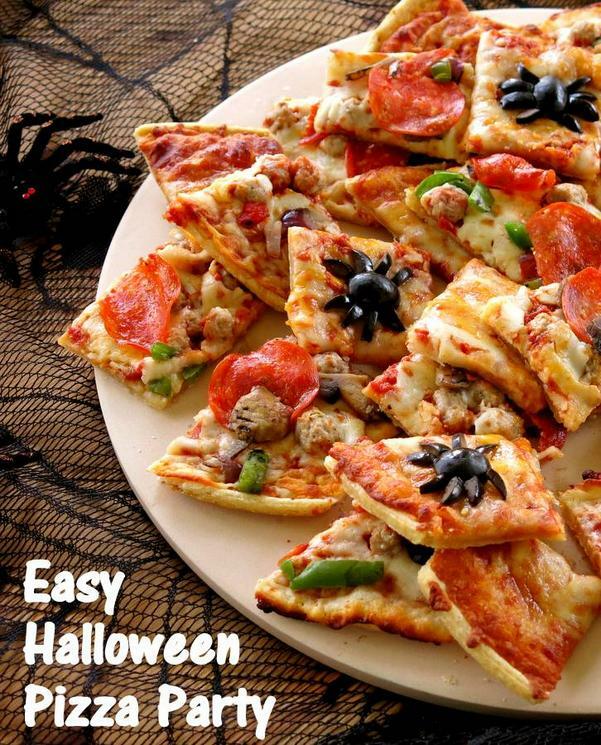 With that picture in mind, I’ve honed a super easy Halloween Pizza Party plan. It allows for less time in the kitchen and more time to enjoy the festivities. Grab and go snacks are allowed. 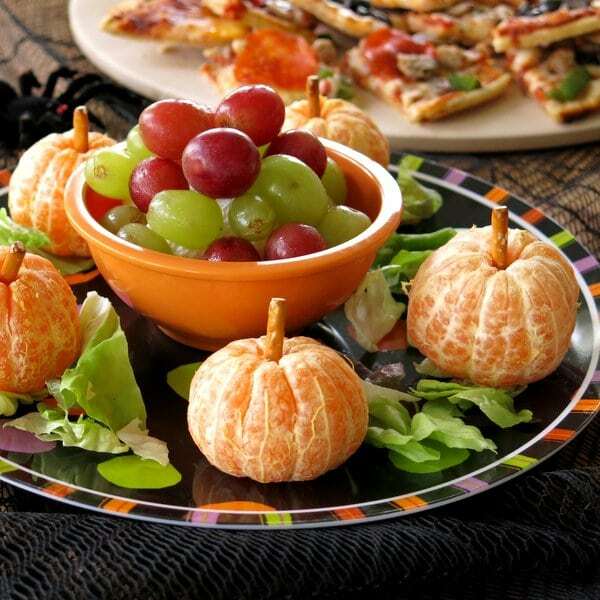 The menu highlights simple, healthy favorites with a Halloween twist. Pizza is always winner. We absolutely, positively love Home Run Inn Pizza. My hubby discovered it several years ago and it’s been a pizza night staple at our house ever since. In case you are not familiar with this brand, Home Run Inn Pizza is all natural and contains NO preservatives. The pepperoni and bacon are all natural and untouched by nitrates by fillers. Even the mozzarella cheese is freshly shredded and contains no fillers. It’s fresh and sooo delicious, just like you get at a pizzeria…which is exactly where this product originated! To make the black olive spiders, cut black olives in half long ways. One half becomes the body. Cut the other half in slivers to make the legs. Strategically place theme EVERYWHERE! Sweet little mandarin oranges become pumpkins with a pretzel stuffed in the middle. 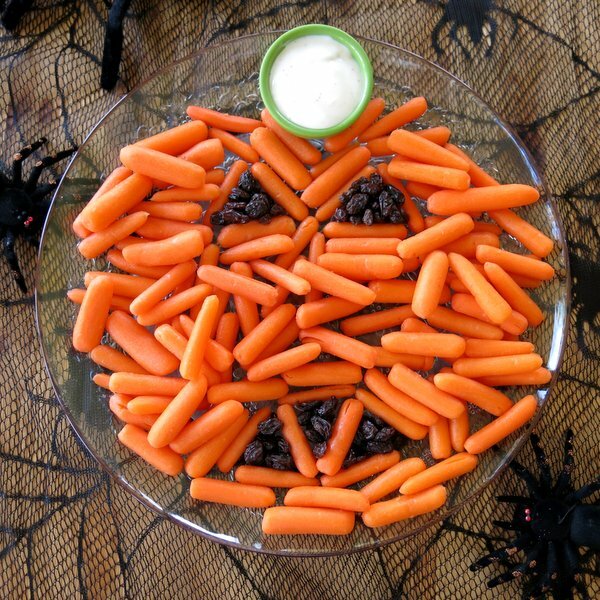 Carrots become a pumpkin with a bowl of ranch dressing (or hummus) for dipping. Raisins make the eyes and mouth stand out. 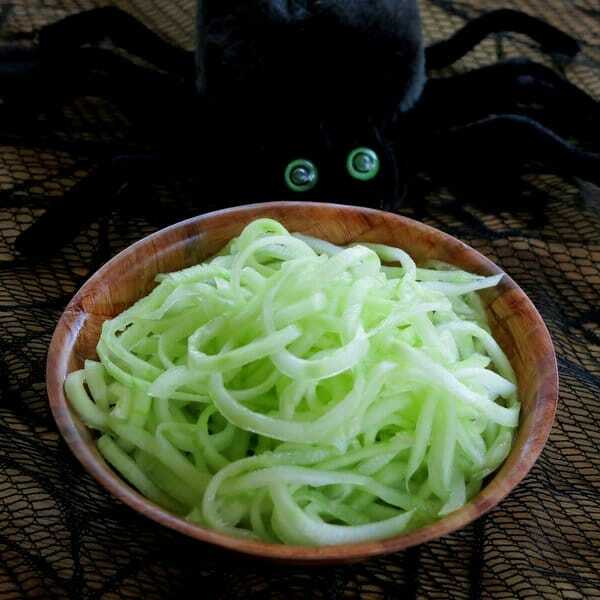 Finally, cucumbers are spiralized for maximum appeal. Toss the noodles with ranch dressing or make Cucumber Onion Salad. I’m not going to try and fool anyone. The kiddos will totally enjoy the pizza and few nibbles of fruit and veggies. Oh my gosh I love all of these ideas!! So easy and just too cute! So cute, love these ideas! And I LOVE those black olive spiders, what a great idea! I love all the adorable ideas for a Halloween party in this post, especially the orange “pumpkins”! And your doggie is the cutest! Your dog is just precious! 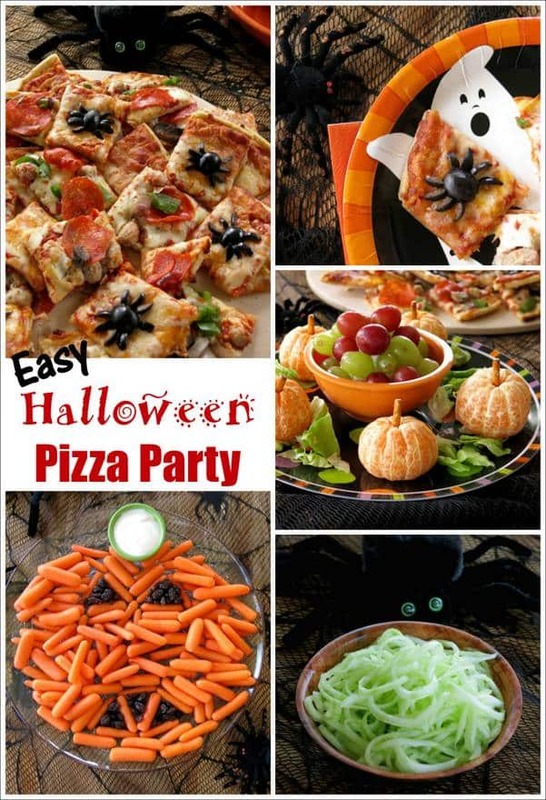 I love all these fun ideas for a pizza party! I want to come to your house on Halloween, Marjorie! Your dogs expression is priceless! 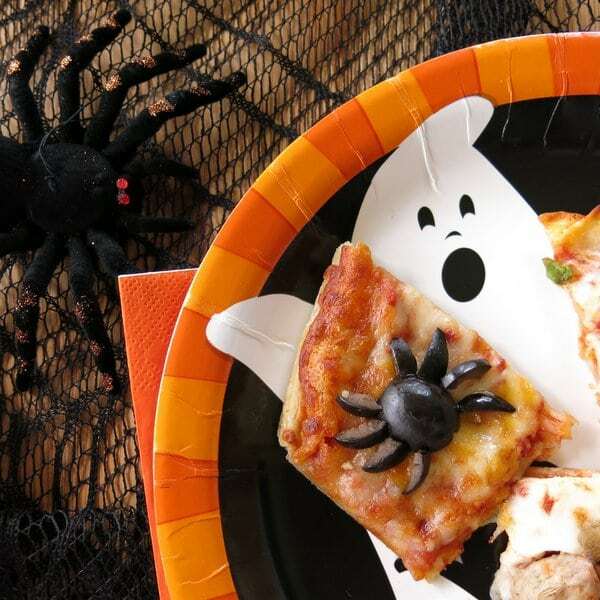 A pizza party is a great idea for hectic nights like Halloween. All of the edible, healthy “decorations” are a nice touch. What a bunch of really fun ideas. You went all out and loving your designs. This is such a cute little halloween round-up. Love that little pizza.